I went to junior high, high school, and college at three different places, but the cheer at the beginning of our school basketball games was the same. In order to get everyone hyped up, the cheerleaders would come prancing out and lead the crowd in saying, “We’ve got spirit. Yes, we do! We’ve got spirit. How ‘bout you?” at which time we would all wag our fingers at those on the opposing side of the gym, egging them on to respond. And respond they did – with the same cheer, except louder: “We’ve got spirit. Yes, we do! We’ve got spirit. How ‘bout you?” And this volley would continue back and forth, back and forth until everyone in the audience was hoarse, trying to “out-spirit” the opposing side by sheer volume. The question cheerleaders ask at the beginning of basketball games is the same question people ought to ask of themselves, though they ought to ask it with a capital “S.” Do we have “Spirit,” as in the “Holy Spirit?” The apostle Peter says that we receive the Holy Spirit when we repent of our sins and are baptized into God’s name and family: “Repent and be baptized, every one of you, in the name of Jesus Christ for the forgiveness of your sins. And you will receive the gift of the Holy Spirit” (Acts 2:38). Thus, if you have been baptized and remember your baptism as you daily repent of sin, there is no question: You “got” Spirit. Although Christians “got” Spirit, sometimes, some Christians want to know how they can get more Spirit. More than once, more than one person has asked me, “How can I be Spirit-led?” Or, “How can I be Spirit-filled?” Some in the Charismatic movement have made this kind of talk about the Holy Spirit the whole locus and focus of their theology. According to these folks, you must not only have the Holy Spirit, you must be filled with Him. And if you are not filled, some in the Charismatic movement would say that your faith is weak and, perhaps, even non-existent. As a Christian, you “got” Spirit. But how much Spirit is enough Spirit? And wouldn’t it be nice to get a little more Spirit? Being Spirit-led and Spirit-filled is not as mysterious, nor is it as exclusive, as some people would make it out to be. Not only does every Christian “got” Spirit, every Christian is filled with the Spirit thanks to God who continuously and generously pours out His Spirit into our lives and hearts. 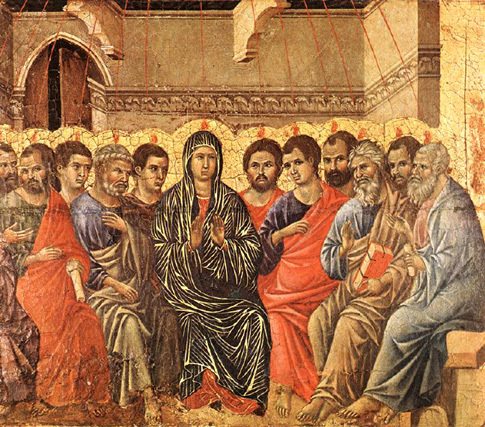 Indeed, this is precisely Peter’s point on Pentecost when he quotes from the prophet Joel: “In the last days, God says, I will pour out my Spirit on all people. Your sons and daughters will prophesy, your young men will see visions, your old men will dream dreams. Even on my servants, both men and women, I will pour out my Spirit in those days, and they will prophesy” (Acts 2:17-18). The Greek word for “pour out” is ekcheo, meaning not only “to pour out,” but “to pour out lavishly.” In other words, God, when He pours out His Spirit, does so generously. Interestingly, this same word ekcheo is used in the Didache, a manual of early Christian liturgical practice, to describe baptism: “Pour water on the head three times in the name of the Father and of the Son and of the Holy Spirit” (Didache 7:3). The Greek word for “pour” is again ekcheo. The picture of baptism, then, is a powerful one: Just as water is poured lavishly over the head of a person in baptism, the Spirit is poured lavishly into his heart. In baptism, every Christian is generously filled with the Holy Spirit. The Holy Spirit is often the most overlooked Person of the Trinity. And yet, His importance can hardly be overstated. For the Spirit dwells in us, leads us, guides us, and gives us faith in Christ. As I mentioned in Adult Bible Class, without the Holy Spirit, there would be no Christians because the Holy Spirit is one who converts us to Christ in the first place. So today, give thanks for the Spirit of God. Give thanks that you “got” Spirit. And not just a little Spirit, but a lot. Entry filed under: ABC Extra. Tags: Charismatic, Didache, Filling, Holy Spirit, We Got Spirit.